Fiery best defines Pitta which is made up of the elements of Fire and Water. Pittas are usually of medium height and weight. You will most likely have an athletic build. You know you are a Pitta if you have light hair with tones of red, but your hair is showing signs of early graying, baldness or thinning. This doshic constitution has a lustrous complexion, with moles and freckles, and it gets sunburnt easily. Your body temperature is usually warm. As Pitta brings together Fire and Water, they are manifest in the liquid medium as acids, enzymes, and hormones. Pitta governs digestion, assimilation and metabolism. This is why your excellent digestion may make you feel like you can eat anything. When in balance, you are intelligent, ambitious and understanding. 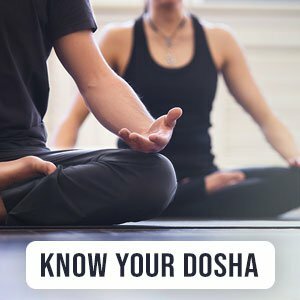 Out of balance, your dosha is expressed as anger, frustration, aggressiveness and tends to cause hyperacidity, liver disorders and rashes. If you are born with a Pitta-dominant constitution, your chosen professions are business owners, teachers, managers and speakers. Your disciplined nature and intense personality makes you a natural leader. However, your perfectionist nature can also make you judgmental and overly critical. Literally and figuratively, Pittas need to keep their cool. Seek foods and activities that are cooling and pleasant. Learn to be more accepting, instead of trying to dominate every situation. Look for healthy outlets to diffuse some of your intensity on a regular basis.